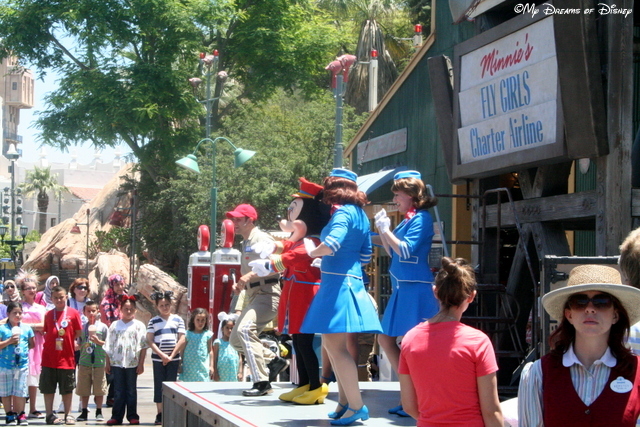 Hello everyone, and welcome to Condor Flats, home of the Minnie’s Fly Girls Show and Soarin’ Over California! This Land of Disney’s California Adventure park pays homage to California’s glory days of aviation, and even has a bit of history to go with it that I’ll share on the next Tiggerific Tuesday Trivia post! This is the first land that we are exploring in our Lands of Disney California Adventure series, and while this land is fairly small, and almost feels like a pass-through from one land to another, it’s certainly got some good points, that’s for sure! 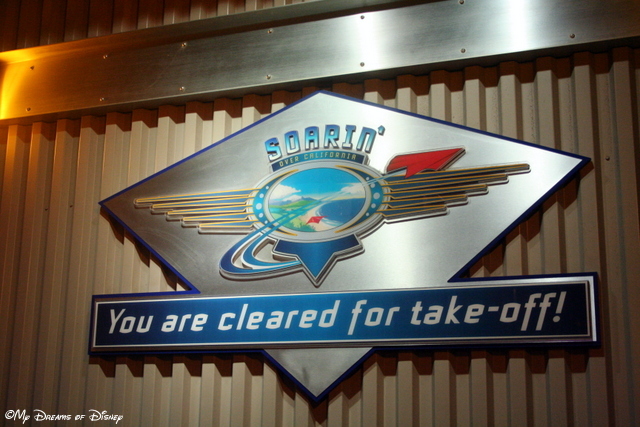 The wonderful thing about the California Adventure version of Soarin’ is that it is no where as crowded an attraction as the version at Epcot is! As a result, you can almost walk right in and get a seat! Other than that, the ride is the same as far as I could tell, but the lack of waiting is certainly a bonus in this writer’s book! After you finish with Soarin’, check out the times for Minnie’s Fly Girls — it’s a fun little show that features the Queen Mouse herself! While you are watching, grab yourself a drink and a churro — the churros at California Adventure are absolutely incredible! For you west coasters out there, the number 47 is prominently featured several places in Condor Flats. I know what the number represents, but do you? If you do, let me know in the comments! While you are in Condor Flats, check out the Fly ‘N Buy Souvenir Shop — and look at the clock inside the shop. It features a unique time that will be discussed in a future post. So, Condor Flats doesn’t have a whole lot to talk about, but it’s still one of the lands of Disney’s California Adventure. Let me know in the comments, please, whether this is a blow through land or one you linger in, and thanks for stopping by today!